Personally, I expected airfields hidden in forrests, very closely guarded. It turned out that the airfields were very open, and lots of the infrastructure could be easily seen from the outside. On the other hand, the whole installation was rather inconspicuous. There were no giant US-style control towers, no radars high above the trees, and especially the gates were very low-key. The roads leading to the airfield were not designed for the western 8 and 5 o'clock traffic flow. The number of shelters on some airfields was quite impressive. Merseburg for example had around 40. We once drove around in the shelter area of Allstedt, and we were thoroughly impressed by the number of shelters, and how they were camouflaged under sandhills. A funny observation was that on many MiG 29 bases, the MiG 29's didn't fit in the shelters! They were apparently sized for MiG 21's, and the twin tail MiG 29 just didn't fit. 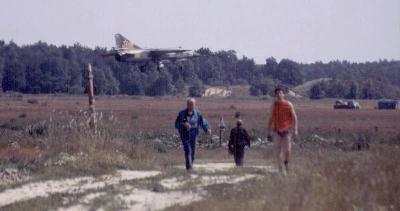 Therefore, many MiG 29's were simply parked in front of the shelters. This was observed at Altenburg, Falkenberg, Köthen and Wittstock. The shelters at Finow (or at least some of them) were big enough for MiG 29's, but that could be expected from a base that hosted MiG 25 interceptors (for intercepting SR-71, so the story goes). Most of the helicopter units had their aircraft parked on PSP (pierced steel planking) plates, that were laid on top of a layer of gravel. This resulted in a rather 'make-shift' appearance of these parking spaces. They were difficult to walk on, too. A nice thing was the old-fashioned flightline that could be found on every fighter base. They were fitted with a concrete blast wall and lighting (looking like regular street lighting). It was always a great sight to arrive at an airbase and see a flightline full of aircraft waiting. On a flying day, the aircraft were towed to the flightline with all kinds of trucks (no special towing equipment was seen). Fuel trucks were used on the flightline; apparently no underground refuelling system was used. The quality of the runways and taxiways was a lot less than the NATO quality we were used too. The RNLAF airfields, on which F-16's are operated, are almost surgically clean to prevent FOD damage. The runways in East Germany usually consisted of concrete slabs with very noticable steps, with sticky tar in between. We drove down some runways in a car (after the Russians had left), and noticed that the car started to 'float' at some 120 km/h. I once nearly stumbled while walking on the runway of Drewitz (an NVA/LSK air base), when I encountered a drainage system lid. It projected some 15cm above the runway surface. 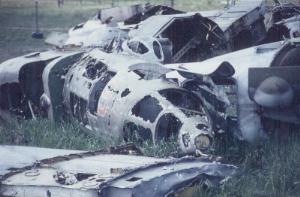 I guess that the sturdy landing gear of the MiG 23BN didn't mind too much, but I'm not sure how an F-16 would fare. A noticable exception was Templin/Gross Dolln, which had very nice runways and taxiways. The story goes that the runway had a heating system (but it had broken down). Quite typical for Russian airfields were the radio stations (ILS ?) on the extended centerline, outside the airbase. Their exact purpose is unclear to me. They looked like they were manned (indicated by for example a parked bicycle), but I never saw something move there. Perhaps these guys had the best job in the air force! Very unusual were giant (3-4m high) reflective orange triangles on the extended centerlines of most runways. They were spaced a couple of hundred meters, and extended some kilomters from the runway. The triangles quickly disappeared after 1990. Up to that point, they were very handy in locating an airfield. The radar installation that I saw at Zerbst consisted largely of truck-mounted systems. It looked like the whole systems could be moved quickly. Another difference with the fixed installations in the west. I don't know whether this was typical though. The security of the airbases was nothing special. Very few watch towers were seen, none of them manned. Unusual were the scarecrows along the fence of Mahlwinkel; one of them quite 'surprised' me at one occasion, the same thing happening a minute later to a fellow spotter. The Russians usually didn't care too much about the spotters at the fences. An exception however were the troops at Mahlwinkel, who were quite aggressive. On more than one occasion they arrested outside the airbase (and probably their jurisdiction). I also almost got arrested there: we barely escaped from a truckload of combat-suited guys, who even fired their guns to stop us. On another occasion a spotter had to spend a night there for an English speaking interogator to arrive from the Wunsdorf headquarters. He had the guard bring him wodka for a few DM, and the two of them emptied a couple. The next morning he still was so drunk he could not be interrogated, and he was released by the furious interrogator. It took about a year for both sides (the Russian troops and the aircraft spotters) to get used to eachother. In the beginning spotters kept a distance from the airfields: I remember photographing Su 24's at Welzow at 1.5 km from the runway, hidden in the woods, with a 400 mm lens. But we learned that they usually did not mind having people with binoculars and cameras near the fence. So much for top-secret Russian airbases. This is Mahlwinkel, one of the large Hind bases. We spent an hour photographing the helicopters before anyone noticed. 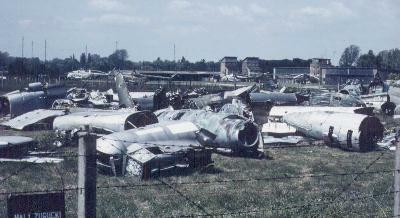 The fences around the airbases were often in a bad shape. The barbed wire was usually severly rusted, and in some cases, the 'fence' consisted of concrete posts with length of broken barbed wire lying on the ground between them. The fence usually was a double one, spaced half a meter. This was annoying for photography. Sticking your camera through the first fence usually meant that some wires of the second fence would be spoiling the shot. Therefore, it was usually 'necessary' to climb through the first fence and then stick the camera through the second fence. The broken fences 'invited' to go onto the bases. 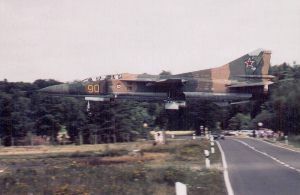 The East German population usually kept a distance to the Russian military installations, although a drunk one was shot and killed at Dresden-Hellerau. Their respect for their own NVA installations was a lot less though, and they crossed them in case this meant a shortcut. Some spotters started going onto the Russian airbases regularly in the last two years. This was particularly 'popular' at Sperenberg, where the two most secret aircraft of the 16AF were stationed. 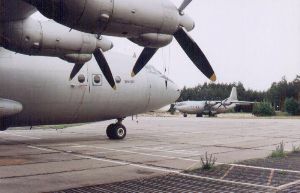 These two Il-20 Coot-A's flew seldomly, and were parked deep inside the base. Once their parking spaces became known, it was not uncommon for spotters to go on the base to take a peek at these aircraft. The Russians noticed the trend, and started guarding the aircraft. The story goes that a spotter from Soesterberg was spotted by the guards, but despite a chase (including some gunshots) he escaped unharmed. At Templin/Gross Dolln you could drive your car through the woods for half a kilometer along the fence, to arrive at the main ramp. From the roof of the shelters bordering it, one had a really impressive view of Fitters, Hips and Hinds. Plus one could dream of the times that Blinders on temporary duty were parked here..
Quickly the troops discovered that they could make a buck selling stuff. Clothing up to complete uniforms, MiG 29 flying helmets, wodka, patches, battlefield flares, 30 mm Hind ammo, you name it and you could buy it. On at least one occasion it worked the other way around and the troops 'bought' cheap from spotters. 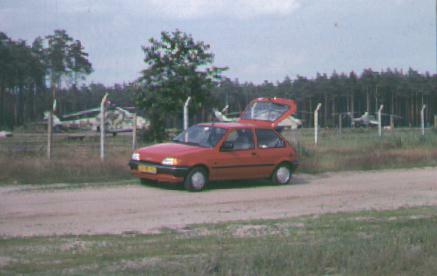 At Oranienburg you had to park your car at the south end of the base, and then walk along the fence on the west side. The Russian troops discovered a pattern, and one day a spotter's car was completely robbed, taking everything up to sleeping bags. Mahlwinkel: an An 12 with strange blisters (later identified as an An 12B-VKP 'Zebra'). It arrived in 1992 (?). I still don�t know the complete story, but it is reported that it made a very heavy landing, and was probably damaged too much to take-off again. So it was parked on the taxiway, and still stood there when the Hinds departed. Some airbases had an old aircraft as a monument a couple of hundred meters behind the main gate. Western style gate guard aircraft were not seen, probably to make the gates as inconspicuous as possible. 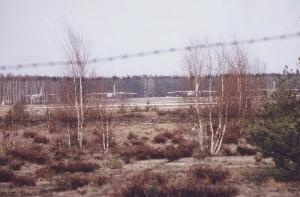 A few auxiliary airfields are known in East Germany. 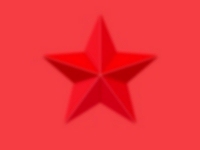 One was found inside a training ground at the Magdeburger Heide. It had an unpaved runway. The other large training grounds were also reported to have unpaved runways. The only auxiliary airfield with a paved runway was Haina, which I visited. It had a 2.2 km concrete runway, and a parallel taxiway with a flightline. 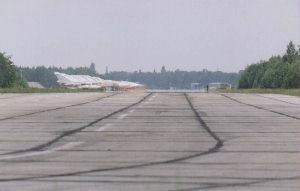 It was rumoured that this airfield was sometimes used by MiG 25's. 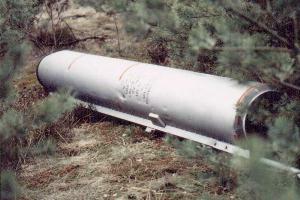 On the east side of the city of Prenzlau, another former Russian air base can be found. It used to house the helicopter unit that moved on the Templin, and then Werneuchen. Through corresponence with a German aviation enthusiast, I learned that the airfields show many leftovers from the second world war. The Russians took over old Luftwaffe airfields, and built only two new ones: Sperenberg and Templin/Gross-Dolln. The infrastructure of the Russian airfields was neither changed much. 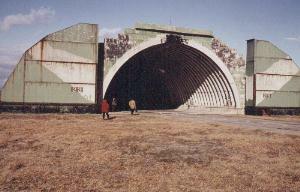 In most cases, the runway was extended, and shelters were added, but that was it. This makes that the Russian airbases are unique in still having WW2 hangars and buildings. The former Luftwaffe airfields in West Germany were largely rebuilt over the years, and show hardly anything from 1945. The similarities between the 1945 Luftwaffe airfields and the 1990 Russian airfields can be judged from the maps shown below.